RedLynx's Trials HD has hit the ultimate in videogame sales milestones. 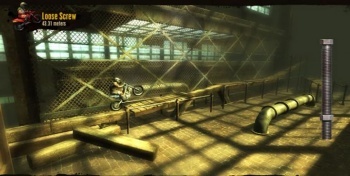 If you've ever played Trials HD, you know that it'll make you holler expletives at times (though usually in a fun way). Multiply all of those expletives by a million and you've got the amount of curse-word energy that developer RedLynx brought into the world, because it's just been announced that the game is a massive seller. When the motorsycle/stunt/racing game was first released on XBLA last year, RedLynx was stoked to see 300,000 sales after a month. The company must be out of its gourd now that the game has sold over one million copies. This does not include sales of Trials HD's first expansion, the Big Pack, either. These are the numbers from Trials HD sales alone, making me think that RedLynx has quite a hit on their hands. RedLynx is currently at work on the second expansion which will include levels designed by fans, named Big Thrills and scheduled for release this year. The developer is also trying its hand at a different style of game called Motoheroz for WiiWare. Games like Trials HD are leading the way for digital distribution, as sales of over a million were once unheard of by a game you didn't see on the shelves at WalMart or GameStop. Digital distribution might never completely take over for brick-and-mortar, but it's definitely a viable platform if developers want to ignore the hassles of retail.